I am not a fan of plastic bags, not only are they not good for the environment, they are a mess to have around the house. As much as I try to remember my reusable ones when I go to the grocery store, I have many times that I forget and end up with a bunch of plastic bags. They can be bulky and a pain to store, but they are good for sack lunches and dog duty. My Mom taught me this great trick which helps store your plastic bags without taking up a ton of room. First, flatten your bag, then fold it in half twice. Next, start folding it in a triangular pattern, until you reach the end of your bag. Once you are at the end, tuck the end tab into the folds, and you have your bag in a small triangle. I store them in one of the Tupperware containers that I don't use (remember THIS?) and put them in my drawer with all my other bags. Then my drawer stays tidy! Easy to use and easy on the eyes! I love this idea! I reuse those bags for so many things so we do get them when we go to the store. I'm actually excited to get them today and try it! =) Thanks! i think i'll be sitting on the kitchen floor this weekend folding bags! I live in Thailand and this is a common practice here for keeping/recycling bags-- our maid does it, but I never figured out how until now! Awesome. I like to roll them instead. I'll fold to make the long strip. But instead of making the little triangle folds, I 'll roll it up. When I have about 2" left to roll up, I'll add another bag and keep on rolling. I'll do this until I have about a dozen bags in a tiddy roll. This then goes into the diaper bag. Thanks for this great tip. I've spent tonight with my 10 year old doing origami with our plastic bag collection in front of the TV - watching The Simpsons! I like to fold mine in thirds. Flatten, fold lengthwise in thirds, fold again into thirds (folding the side with the handles first and then the bottom over the handles). It will fit perfectly into a standard shoe box. When I saw this tip I had to grab a plastic bag (just went to the store) and folded it. Great tip and kinda fun too! I just did this with all our plastic bags and it seriously saved so much space! Thank you for posting this. It's actually going to be one of the first posts on my new blog and I will link back to this post. Now if I could just figure out how to neatly organize all the paper bags maybe the "bag cabinet" wouldn't be so scary anymore. Brilliant. I'm soooo doing this. And it's a craft my bad-crafty-self can actually do. I just gave you props for sharing thins. Thanks so much! I keep 4 of them in my bathroom trash cans under the current bag/liner. Wow! What a brilliant idea of disposing plastic bags. It's very helpful for everyone of use here. Fabulous! I found this on Pinterest!!!! LOVE THIS! I went from a scary-full cabinet stuffed with plastic sacks to 4 small-ish containers of neatly folded bags. I now have an entire cabinet to store/organize something else. Thank you for sharing this very helpful information. I will be blogging about this accomplishment and what else it inspired this coming week. Thanks again and God bless! I cut the top off of a gallon milk jug and stuff the bags into it. Keeps them containerized and easy to reuse. Also, a "tube" of fabric - open at both ends but with a loop hangar at one end and elastic at the other, can keep them neat but easy to use. 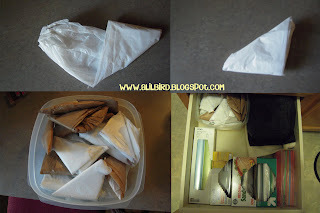 I keep my folded bags in empty kleenex boxes, & label the boxes "regular " (for grocery bag size); "small" (ie: vegetable size bags); "Large" (oversize bags). 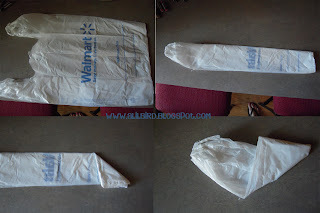 I have always folded my plastic grocery bags, although not this neatly. To store them, I cover a small (laundry detergent?) cardboard box with pretty contact paper (the boxes last longer if covered) and place in my laundry room and under the bathroom counters. They are handy and pretty to look at. I sat here all weekend doing this. I used to have 15 bags filled with all the other bags but now have 378 plastic bags neatly folded for all sorts of jobs into TWO 1/2 other bags! great tip! One Dollar Wednesday...Crazy Hair Day! Adventures In Homemade Baby Food: Peaches. More Lunch Box ideas and a before picture. . .